Oh man, I hope this one does okay at the box office. It was rather desolate in our cinema tonight. At 02:38:00, you'll definitely get your money's worth, and I thought it was a beautiful—if not sobering—film. Act II is surprising: I did not realize a near hour would comprise what amounted to a hostage scene. I was completely unfamiliar with this story, and I'm embarrassed to admit that. Watts, Newark, Philadelphia, Memphis, Chicago, Harlem, Louisville, yep, but Detroit? The execution-like details were news to me. So many lives, snuffed out or shattered in an hour's time. The more things change, the more they stay the same. 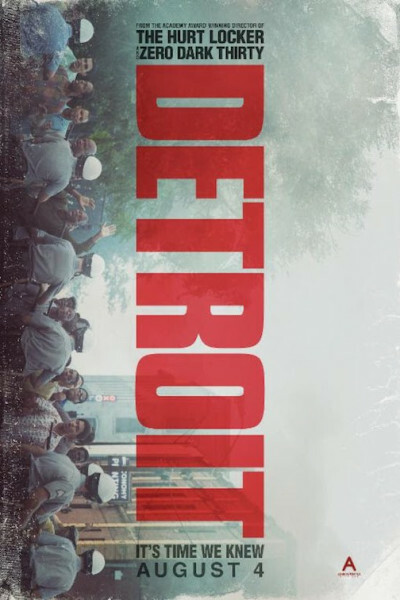 Fortunately, Detroit tells us the story, and honors many in the telling.